A lively discussion has developed in Sweden around the effect of LVT on small farmers. There are not many of them but they are an influential pressure group. 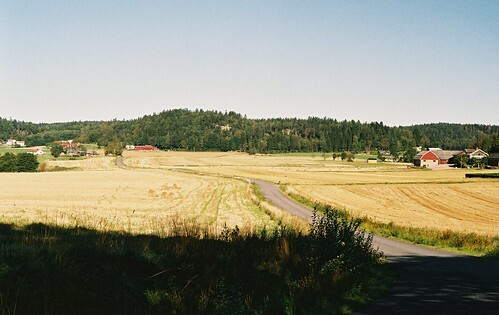 Small farmers in Sweden have traditionally opposed LVT, unlike their counterparts in Denmark. The issue of small farmers also surfaced in Britain a few years ago, at a fringe meeting at an LibDem annual conference. If LVT is levied on the selling price of land, small farmers would be faced with an unjust burden as land prices, especially close to urban areas, include an element of speculative "froth" which reflects the expectations of future rental growth or the added value of possible development opportunities. So long as LVT is based on annual rental values, as we propose, there should be no problem for small farmers. For tenant farmers, the tax makes no difference as it cannot be passed on. For owner-occupying farmers, the tax would in most cases lighten their overall tax burden. Owners of marginal land used for grazing and forestry would pay next to nothing. Owners of better quality arable land would pay more, but in the overwhelming majority of cases, they would still be compensated by lower taxes and lower costs, since the cost of labour-related taxes is built into the prices of all goods and services. Thus, as the Danish smallholders appreciated a century ago when they put their political weight behind LVT, the shift from present taxes to LVT would make small scale farming more profitable, whilst the removal of speculative froth from land prices would enable more people to take up small scale farming as a way of earning a livelihood. If a broad view is taken, the bulk of land value in any country is in the centres of the most prosperous cities. Thus the effect of replacing existing taxes by LVT is to reduce the overall tax burden on agriculture.